There are many people who want the convenience and security of an electric shredder, but don’t really need an expensive model. For these people, there are many affordable types on the market that can do a very good job at a low price. 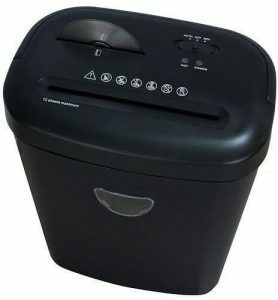 One of these is the ProAction 8 Sheet 13 Litre paper shredder (CHECK PRICE NOW!). It has many of the features that you would need, but at a slightly limited ability. Let us see some of the features that this shredder has to offer. The product has a throat width of 220mm. This means that it can handle most sizes of paper with no problems. The large 13 litre bin is large enough to hold many sheets of shredded paper before it requires emptying. This saves you time while still being compact. The strong blades are able to cope with credit cards as well as paper. This is a great way to ensure that you effectively destroy any personal data. It can also shred up to 8 sheets of paper in one pass. This is more than enough for normal home use. It also means that you can shred thicker paper with no problems. With a shredding speed of 2.5m per minute, you can make fast work of your documents, leaving you more time for other things. Weighing just 6kg, the ProAction shredder is light enough to be transported easily. This means you can clear out rooms without walking backwards and forwards to the shredder. The ProAction 8 Sheet 13 Litre Shredder is a very effective product that will deal with the day to day needs of the home. Although it has some limitations, these shouldn’t be any barrier to making this a great addition to the home office.